To help do the origami, I stuck some medium weight interfacing on the back. With each fold, I ironed it down to help it stay. Fleece was hard to work with because it does not fold easily, was soft and thick, and couldn’t be ironed scorching hot. So having had success here, all the future fabric origami I’ll be doing will be downhill! Now, what the heck would somebody do with fabric origami, you might ask? Well, what do you know that’s worn, fabric and folded intricately? Handkerchiefs, maybe? I don’t know about you, but I never actually use those handkerchiefs. I don’t find them practical, and don’t care to stick it back into a suit if I did use it. It’s decorative to me. So that’s where I’ll be applying this in my future fashion. 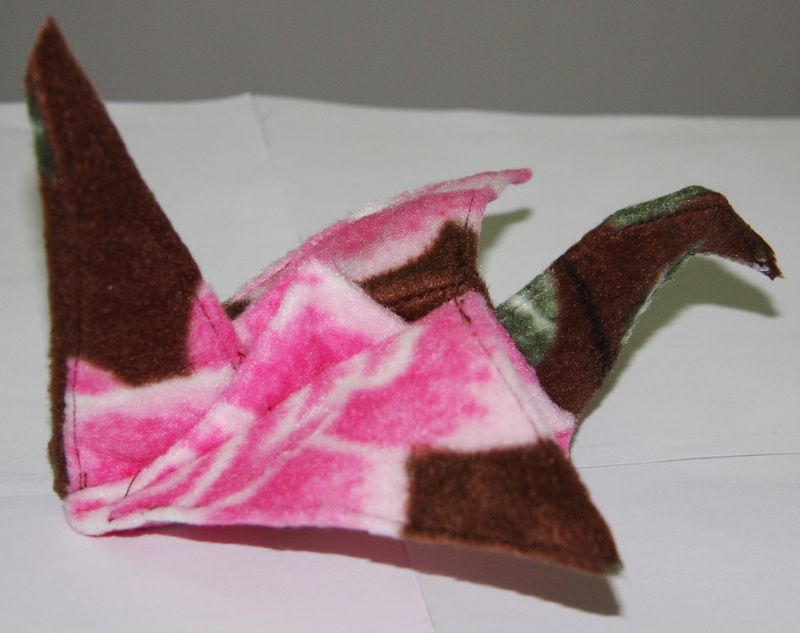 I can make “flat” origami, including this crane with its wings folded up or down. With thin, smooth and shiny handkerchief fabrics, I can make some rather nice pins of a handkerchiefs to wear! Please click here to see more of my fashion garments and writings on this site. Thank you. ← Do You Know about the Mantis Shrimp?